History just would not be history without a few ‘what-ifs’. What if, we ask ourselves, event ‘x’ had not happened: how would have history subsequently unfolded? In much the same way as what did happen, or in a completely different way? The National Portrait Gallery’s latest exhibition will leave you asking this very question: what if a certain Henry Stuart, eldest son and heir of King James VI of Scotland and I of England, not died suddenly in the autumn of 1612? It is certainly not an overstatement to suggest that the whole complexion of British history from the seventeenth century onwards might well have looked very different indeed, given the stark contrast in personality between this charismatic, intelligent and cultured young man, and the man who became king instead of him. His weak and timid younger brother Charles would go on to reign as Charles I, lose a civil war and ultimately his head on a scaffold on Whitehall. Furthermore, as the very first exhibition about the would-have-been Henry IX shows us, this was someone whose influence was felt well beyond the shores of Britain in his short life, winning himself many admirers abroad and taking a keen interest in diplomatic relations with other European powers, so to say that the whole of European history would have looked differently would not be much of an an exaggeration either. Only the story of Arthur Tudor and his younger brother Henry can rival this as the British monarchy’s all-time ‘what-if’, and I think it’s fair to say that plenty has been said and written about that already. By all accounts it would appear that Henry Stuart was a prince who poccessed all the kingly virtues – athleticism, intellegence, charisma, and a firm conviction in his (protestant) faith and his morals. He also seems to have been keenly interested in just about everything a renaissance ruler was expected to be keenly interested in – raging wars and planning military campaigns, building grand palaces and landscaping fine gardens, and collecting art and various other treasures. This last attribute is particularly important to the story, for Prince Henry appears to have differed from his father in this aspect, and because his collection represents the first of its kind in England. His was the first collection in Britain of antique medals and gems. His was the first collection of fine Italian scultpure in Britain. And, thanks largely to the aquisition of John, Lord Lunley’s library (and some thousand-or-so further volumes before his own death) he laid the foundations of a royal library. What Henry appears to have done is understood, in a way that none of his ancestors had done, how a collection of beautiful and rare objects could be used to serve as a reflection of his own discernment, intellect and general magnificence. Objects on display from this collection include two portrait sketches made by Hans Holbein (some of the most precious works in the Royal collection), an equisite brass horse sculpture by Pietro Tacca (a gift to Prince Henry from the Medici family) and the lone surviving object in what was once a large collection of scientific and navigational instruments, a small astrolobe. The most impressive portraits of Henry by far are all by one artist, Robert Peake the Elder. He may not be among the most famous of royal portrait artists, but this exhibition strongly suggests that prince Henry’s early death may in fact have had a lot to do with this. Peake was the first royal portrait painter to show his subject in ‘action’ poses, and the first to paint imagined landscape backgrounds behind them. And it would appear that it was painting the young heir to the throne that brought out the best of Peake, a man well into his fifties at this point, who had previously painted potraits of king James and his predessor Queen Elizabeth I in a standing-still, plain-background, far more conventional style. It is telling that after Prince Henry’s death, Peake’s royal portraits returned to this more conventional style. It is as though with such a dynamic royal personality gone, Peake had lost his enthusiasm for painting such dynamic portraits. Also telling is the complete lack of sparkle in his painting of Henry’s younger brother Charles, made shortly after Henry died when the 12-year-old Charles became the new heir of the Stuart dynasty. 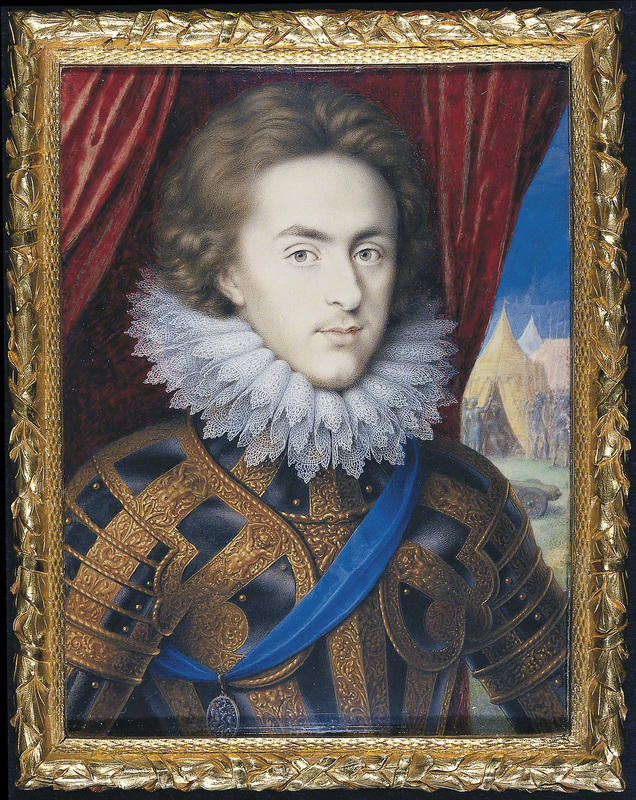 In all of Peake’s portraits, Prince Henry exudes confidence, and Peake clearly loved painting him. 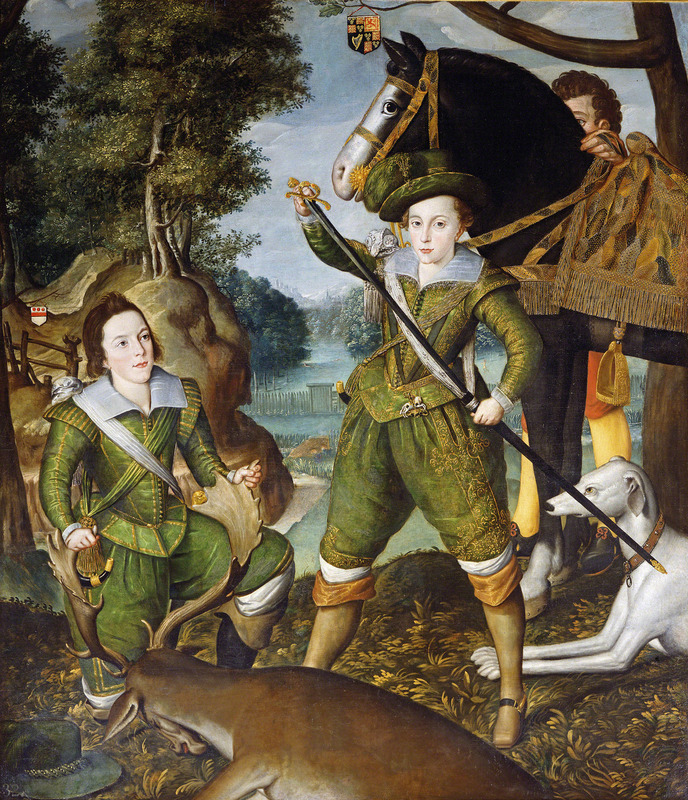 In one portrait, out on a hunt with his friend the Earl of Essex, the nine-year-old prince stands holding a long sword, legs apart in a pose remenicent of his ancestor Henry VIII. In another, he is shown in exeburant, highly decorative armour (much like the two sets of armour on display especially made for Prince Henry), every bit the military leader. Even in Isaac Oliver’s miniture, which was later copied by various other artists in an even smaller form, there is just enough space to paint in a backround showing an army camped in tents, before or after a battle has taken place. Sure, it seems unlikely that Prince Henry was a skilled hunter by the time he was nine, and we know for certain that he never faught in any battle, never mind command an army. But this was a future ruler, not a past or present one, and so it was the Prince’s virtues, and kingly attributes, rather than his achievements or accomplishments, that counted (and besides, accounts say that he was an excellent swordsman). Peake and others used rich symbolism to illustrate the young heir’s promise, his potential to be, for example, a great military leader. The most symbolic of all Robert Peake’s paintings of Prince Henry was probably the most striking of all in the exhibition. The Prince is on horseback (in the first full-length equestrian portait of any English prince, or indeed King) leading Father Time, his forelock tied to a coloured scarf around the prince’s arm, along behind. This is the leader of our brave new future, grabbing hold of time itself and taking us into this new century, this picture says. Royal portraits don’t ever get much more emphatic than this, and amazingly this particular royal is a boy of barely 12, not yet a ruler in his own right. Even if you want to dismiss the portraits as just another load of pictures made to make a royal look good, all symbols and flattery, then amongst the other objects that make up this exhibition you can still find insight into what Prince Henry was really like and, perhaps more intriguingly, of what kind of a king Henry IX might have been. He was a keen letter writer, frequently corresponding with both rulers and relatives on the continent, and taking an active role in the marraige negociations for his sister Elizabeth, suggesting he had the makings of an able diplomat (he had very nice handwriting too). His godfather, King Henri IV of France, spoke particularly highly of Prince Henry, and sent him all manor of gifts including armour and horses. Henry also took a keen interest in the affairs of state, often coming into conflict with his father, who was far more cautious than his son when it came to foreign policy and miltary matters. At one point Sir Walter Rayleigh, out of favour with the king and imprisoned in the Tower of London, wrote a treatese on shipbuilding which he sent to the eager Henry. But probably most impressively of all, Prince Henry was keen to place himself at the forefront of Britain’s efforts to discover new lands and colonise them. He personally financed an expidition by the explorer Henry Hudson intended to discover the ellusive north-west passage, and establish a new trade route to Asia via the northern coast of America, and was kept up to speed with developments in England’s still very young colony of Virginia with various accounts and several maps charting newly discovered lands (some of which, like cape Henry, were duely named after him). I strongly believe Henry would have been a king who thought internationally, globally even, and would have always been thinking in terms of a long term strategy rather than short term solutions. It is anyone’s guess what Britain – a new concept in itself, with his father being the first king of both England and Scotland – would have emerged under the leadership of Henry IX, but at least we get a good idea in this exhibition what kind of a nation Prince Henry wanted it to be. And the more we learn about him, the more and more unlike his weak and ultimately disastrous younger brother Charles he seems. Perhaps, had he succeeded his father as king, Henry IX would have faced all the same problems that Charles I did in the 1630s and 40s, and perhaps no amount of kingly virtues could have enabled him to deal with the rising power of parliament without resorting to the same tactics his brother did? Indeed, would a man blessed with all the ideal virtues of kingship like Henry really have been prepared to relinquish some of his powers in order to avoid a war with parliament? And perhaps, if a war was unavoidable, king Henry IX would have defeated Cromwell, and ushured in an age of absolute monarchy? I could ask a thousand more of those kind of questions and write the longest blog post in history, but I’ll stop there for now! Upon the death of Prince Henry – four hundred years ago next month – a whole nation mourned. One only need read some of the contemporary accounts, the poems penned after the Prince’s passing, and the pieces of music specially written for his funeral (no less than four of these pieces of music are on display, one of them can even be heared playing in the final room of the exhibition) to realise just how great the sense of loss was. There were two thousand people in Prince henry’s funeral procession – five hundred more than at Elizabeth I’s funeral nine years earlier – and the effigy placed on top of his coffin was lifelike enough that it moved, according to one account, “an innumerable multitude of all sorts of ages and degrees of men, women and children … some weeping, crying, howling, wringing of their hands, others halfe dead … passionately betraying so great a losse with rivers, nay with an ocean of teares.” The remains of the effigy can be seen in the final room – a wooden torso with legs attached, arms and wax head long gone. A rather dull and featureless object it may be, one that curator Catherine MacLeod was initially skeptical about including in this exhibition, but she eventually came to the conclusion that it is an apt place for the exhibition to end since, sad relic that it is, it serves as a symbol of Prince Henry’s legacy – one that has gradually faded from the public imagination to a point where, like the effigy, almost nothing remains. The Lost Prince: The Life & Death of Henry Stuart will, she hopes and I hope, go some way to bringing Prince Henry’s legacy back to life. Tags: 17th century, Britain, Charles I, colonisation, Drawings, Elizabeth I, England, English civil war, exhibition reviews london, exhibitions london, France, Hans Holbein, Henry IX, Henry Stuart, Henry VIII, Isaac Oliver, James I, James VI, National Portrait Gallery, Oliver Cromwell, painting, parliament, portrait, power, Prince Henry, Robert Peake the Elder, Royal Collection, Scotland, Stuart, The Lost Prince, the Lost Prince review, Virginia, war. Bookmark the permalink.